I’m a Midwestern gal. Born and raised right outside Toledo, Ohio, I have a soft spot for the region that locals in my “adopted” city refer to as “flyover country”. To us, Chicago was always the BIG CITY. Everything was in Chicago. It had excellent culture, great food, and incredible universities. It was also within driving distance from us (about five hours away). In fact, the owners of the local Chinese market in Toledo where we shopped drove to Chicago at least once a week to pick up items to bring back to the store. Sometimes if we had requests, the shopkeepers would try to find it in Chicago. This is long before the days of Internet, when it was much harder to find quality Asian ingredients and foodstuff. I only visited Chicago once as a kid with my family. My sister went to Northwestern University for college, so I did travel to Chicago a couple times while she was in school. Back then, I wasn’t really there for the food. Sure, we had some touristy things like the famous deep dish pizza, but not much else. And then that was it. Even though it’s so easy to access (we stop at O’Hare all the time), I never visited Chicago again. 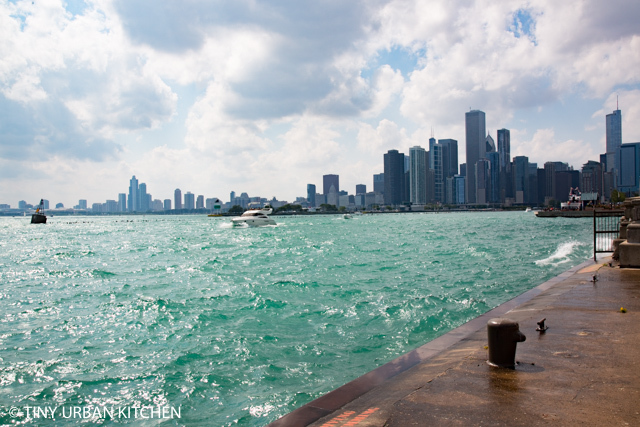 It wasn’t until this past September, when we secured a reservation at Alinea, that we finally decided to really spend a few days exploring Chicago. I totally, totally fell in love with the city. Chicago is an incredible city, and I can’t believe I waited this long to visit. I loved the skyline and the numerous “waterfront” areas – there are multiple rivers, canals, and also the Lake, which really looks like an ocean. We learned about city’s fascinating architecture via an excellent river boat cruise (pictured above). We explored world class art at the Art Institute of Chicago, a stunning museum that houses an impressive collection of art. We hung out at Millennium Park listening to jazz during the Jazz Festival, soaking in the unbelievably perfect weather. Chicago has some of the best food in the nation. We only had a weekend, which was a very short amount of time in which to experience the breadth of places in Chicago. We tried our best, but obvious we need to come back to this special city! We were visiting Chicago with fellow food-obsessed friends. These friends had told us multiple times about Rick Bayless’s legendary Oaxacan black mole, a complex Mexican chile sauce that uses twenty-seven (!) ingredients. Frontera Grill, Rick Bayless’s restaurant, was one of the first places we visited, and we made sure we finally got the chance to try the famous flavorful sauce. At lunch, we also tried Rick Bayless’s more upscale Michelin-starred Mexican restaurant next door, Topolobampo. The food was vibrant, flavorful, and very good. Dinner another night was at The Girl and the Goat, a hot, buzzing restaurant from Top Chef winner Stephanie Izard that the Chicago Tribune called “the toughest reservation in town”. Because we were a party of six, we had the luxury to sample a wide variety of dishes. The food was edgy, creative, and fun, with several brilliant dishes. Three Michelin starred Alinea by Grant Achatz was the main reason for the trip (that and our 15th wedding anniversary, I guess!). We booked the coveted Alinea’s Kitchen Table, which is located inside the kitchen with glass doors all around allowing unparalleled views of the kitchen. It was a phenomenal meal, full of wow moments both in terms of presentation as well as taste. As “first time visitors” to Chicago (I would count a 2o-year hiatus as equivalent to having never visited), we felt the need to try some well known and famous Chicago classic restaurants, like Portillos, one of the best places to get a classic Chicago hot dog. Lines get long, so we showed up around 11AM to beat the lunch crowd. Here it is – the classic Chicago hotdog has a beef Vienna hot dog inside a poppyseed bun and filled with green relish, yellow mustard, fresh tomatoes, raw onions, a Kosher pickle, pickled hot peppers, and celery salt. We also tried TWO deep-dish pizza places. In general, famous deep dish places are very popular and often have super long waits. Either eat at unusual times or be willing to wait before being seated. Our first stop was Lou Malnati’s Pizza, a well-known family-owned pizza place that has been around since 1971. They are known for their decadent, buttery crust that almost resembles a pie crust. The fillings are decadent and oh-so-satisfying. Although the wait around 2PM was still around an hour, we lucked out by snatching seats at the bar, which allowed us to eat much, much sooner. We visited another institution, Giordano’s, which also makes deep dish pizza. Deep dish pizza takes about 45 minutes to bake, so you really need to order as soon as you sit down (or maybe even while you are waiting in line). We showed up at Giordano’s at 4PM so we were seated immediately. However, it’s common to wait an hour or two for a spot at one of these hot places. And that was it! I think we did quite well considering we were only there for three days. Still, there is so much more to try in Chicago. We have barely scratched the surface. Stay tuned in the coming weeks and months as I explore in more detail some of the meals we had at restaurants described in this post. I’m so glad you did a post on Chicago, my hometown! Next time you go, I recommend Avec (chorizo stuffed dates and the deluxe focaccia) and Bavette’s (shortrib stroganoff, elote side, dry aged New York strip or the Ribeye, and their frites). Chicago also has good Italian and I would recommend Davanti Enoteca (ricotta with honeycomb) and Siena Tavern for more modern Italian but my favorite traditional Italian place is Viaggio’s (8 finger cavatelli with Vodka sauce, meatball salad, and eggplant stack). Been following your blog for years and. I’ve tried several of the restaurants you’ve recommended internationally. All your recommendations have been fantastic and always look forward to reading your posts. Thanks!